Myrtle Woods Golf Club is set beside the scenic Intracoastal Waterway. Enjoy a fun game and meet others at the same time. Teens will love the lazy river while the little ones play in the fountains. Cruise on the indoor lazy river even on rainy days. A swim in the resort's indoor pool is the perfect way to escape the cold. Myrtlewood Villas is set next to the Intracoastal Waterway near the heart of Myrtle Beach. Stop by your condo rental to drop off your luggage and get changed into swimsuits. Grab pool toys, water wings and goggles before heading out for a swim. Don’t forget the sunblock! There are 2 Pools (Indoor & Outdoor) to choose from. Lounge by the outdoor pool with a cocktail and the latest issue of US Weekly while you work on your sun-kissed look. The indoor pool is perfect for rainy days and the winter months. Younger kids will love splashing around in the children’s pool and the indoor lazy river will be a hit with kids and grown-ups alike. Need an afternoon pick-me-up? The on-site coffee shop, 48th Avenue Coffee, serves Starbucks espresso, tea and Frappuccino beverages along with a variety of snacks and food. The golfers in your party will enjoy the 36 holes of championship golf on the 2 on-site golf courses that make up Myrtlewood Golf Club. The sandy volleyball court is a great place to make new friends or get together for a family face off. Thinking burgers for dinner? Take advantage of the BBQ grills for a cookout. One-, two- and three-bedroom individually furnished & decorated units sleep four to eight guests. Full kitchens allow you the freedom to whip up anything from a quick snack to a multi-layered lasagna. Take the kids along on a grocery run to Food Lion to make sure that no one’s favorites are forgotten. Break in your new kitchen by baking a batch of your famous double chocolate brownies. Recruit your junior bakers to assist, not that they'll need convincing. Just in case the kids end up with chocolate somewhere other than their face, you have an in-suite washer/dryer. When it comes to in-suite entertainment, the TV with DVD player has you covered. Bring favorite movies from home and call the kids into the living room. First one on the couch picks the movie. Put your multitasking skills to good use and throw in a load of laundry while the movie is playing. Cable ensures that you won't have to worry about missing your favorite show. 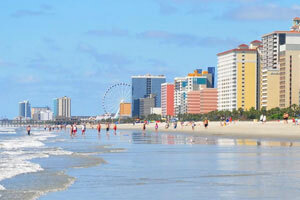 Broadway at the Beach is one of Myrtle Beach’s most popular tourist spots and has a variety of attractions. Ripley’s Aquarium features a 750,000-gallon shark tank, a stingray experience and glass-bottomed boat rides. Let the kids run off their energy at the Play Park which has three play areas for children who are preschool to school-age. Get ready for your close-up! Come face to face with the stars at Hollywood Wax Museum Myrtle Beach. Frank Sinatra, Lady Gaga and Audrey Hepburn are just a few of the stars that you can encounter. Take a ride on the SkyWheel, located at the Myrtle Beach Boardwalk. It’s almost 200 feet tall and thanks to the climate controlled gondolas everyone in your party can ride in comfort. - The front desk is open daily 7:00 AM - 11:00 PM. Guests that arrive after 11:00 PM can pick up keys to the unit from a lock-box located outside of the front desk office. For more information please contact the property in advance using the information on the booking confirmation.